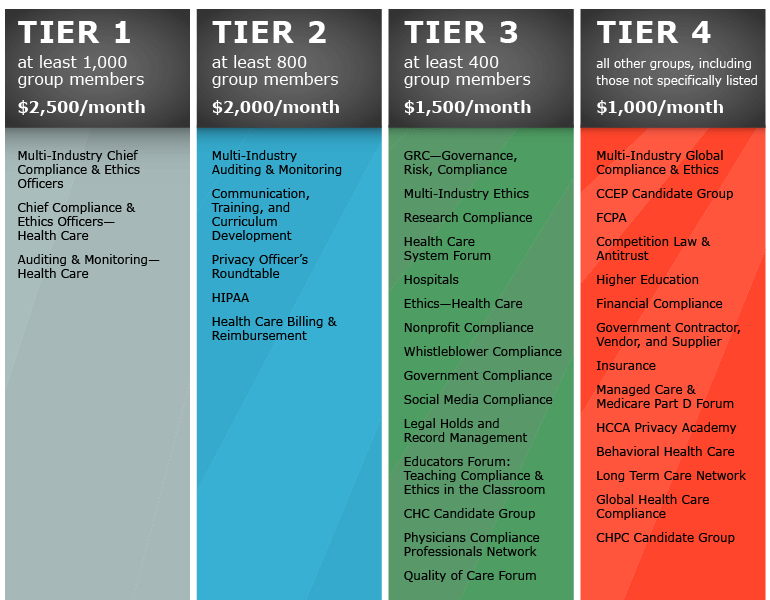 The joint social network for the Society of Corporate Compliance and Ethics and the Health Care Compliance Association (SCCEnet/HCCAnet) is a success with over 13,000 registered users and tens of thousands of emails going out each month to its members. As a sponsor, you will enjoy an exclusive sponsorship presence in the social network groups you choose. No other vendor to the community’s ads will appear in the emails and the discussion group. Ad requirements are gif or jpeg formatted image files 150 px wide by 250 px tall that will link to your website. Spend some time exploring and participating in the discussions at our social network site: community.corporatecompliance.org. Pick out the groups that are right for you. Please contact Lori Dahmes with any questions at lori.dahmes@corporatecompliance.org or (952) 567-6213.